The life science industry is focused on the development of advanced NIPT tests using genome sequencing technologies for the early detection of genetic disorders. The increasing prevalence of genetic disorders and development of the healthcare infrastructure are promoting the adoption of the NIPT for better diagnosis and improved prenatal care. Non-invasive prenatal testing (NIPT) is a sophisticated method used for the screening of chromosomal abnormalities developing in the fetus. Currently, NIPT is considered as a valuable test for the pregnant women to provide cost-effective and highly efficient early diagnosis of genetic disorders. Moreover, advancements in genome sequencing technologies reduce turnaround time and the complexity of diagnosis with next generation sequencing (NGS). The NGS technology provides several opportunities to develop the non-invasive diagnostic procedures for an early and accurate detection of various genetic disorders. The life science industry is witnessing significant growth of NIPT tests developed using the NGS technology. Several biotechnology companies are now indulging in the research and development of such NGS-based NIPT products. Furthermore, the advent of genome sequencing technologies in the life science industry has enabled the companies to detect the genetic diseases at an early stage and provide accurate results to remain competitive in the market. The purpose of this study is to gain a holistic view of the NIPT market in terms of various influencing factors, such as recent trends, regulatory requirements, and technological advancements of the market. The scope of this report constitutes a detailed study of the tests associated with the global NIPT market across different regions. The market has been segmented into ‘tests,’ ‘methods,’ ‘platforms,’ ‘applications,’ and ‘regions.’ The report presents the reader with an opportunity to unlock comprehensive insights with respect to the market and helps in forming well-informed strategic decisions. The research uncovers some of the substantial parameters that must be taken into consideration before entering the market. This research report aims at answering various aspects of the global NIPT market with the help of the key factors driving the market, restraints, and challenges that can inhibit the overall market growth and the current growth opportunities that are going to shape the future trajectory of the market expansion. The report includes an in-depth examination of the key players and recent developments taking place in this market. Moreover, the report includes chapters on market dynamics (market drivers, opportunities, and challenges) and industry analysis as well. The research study highlights the factors governing the industry attractiveness with Porter’s Five Forces for a comprehensive understanding of the global NIPT market. Moreover, the study includes detailed product mapping with further sub-segmentation in various countries, and in each sub-segment, the key market trends, list of the key companies, and the key strategies and developments have also been discussed. • How did the NIPT market evolve, and what is its scope in the future? • What are the major market drivers, challenges, and opportunities in the global NIPT market? • How the influencing factors will affect the industry attractiveness? • How NIPT is utilized for the detection of chromosomal abnormalities? • How investments by public and private companies and government organizations will affect the global NIPT market? • What was the market size of the leading segments and sub-segments of the global NIPT market in 2017? • What will be the growth rate of the NIPT during the forecast period? • How will each segment of the global NIPT market grow during the forecast period, and what will be the revenue generated by each of the segments by the end of 2028? • Which test segment, and application segment is expected to register the highest CAGR for the NIPT market? • What is the market size of NIPT in different countries of the world? • Which geographical region will contribute to the highest sales of NIPT? • Who are the key players in the NIPT market, and what are their contributions? 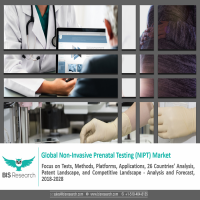 The key players who have been contributing significantly to the NIPT market include Agilent Technologies, Inc., Annoroad Gene Technology, Berry Genomics Co., Ltd., BGI Diagnosis, Centogene AG, Counsyl, Inc., Eurofins Scientific, F. Hoffmann-La Roche AG, Illumina, Inc., Laboratory Corporation of America Holdings, Natera, Inc., Next Biosciences, NIPD Genetics, PerkinElmer, Inc., Premaitha Health Plc, and Quest Diagnostics Incorporated, among others. 10.4 Berry Genomics Co., Ltd.
Non-invasive prenatal testing (NIPT) is a sophisticated method used for the screening of chromosomal abnormalities developing in the fetus. It is a novel genetic screening method based on the analysis of cell-free fetal deoxyribose nucleic acid (cff-DNA) in the maternal plasma. The genetic screening is performed between 10-22 weeks of time frame, with small amount of blood sample and requires a minimum of 10 weeks of pregnancy for apt results. It is commercializing at a rapid pace due to emerging technologies for non-invasive analysis of the fetal genome, thus reducing the cost-effectiveness of NIPT. The exponential growth of the NIPT market is supported by various factors, such as reimbursement policies, insurance coverage, high incidence rate of Down syndrome, no risk of miscarriage with NIPT, and shifting trend toward child birth at an advanced maternal age (35 years or above). Since the past few years (2011-2017), prenatal genetic testing has come up with new innovative and non-invasive technologies and testing options. However, it has been a challenge for women’s healthcare providers to keep up with the swarm of publications and provide patients with the most accurate information regarding prenatal testing. Since a decade, researchers, physicians, and even pregnant women have been observing the benefits of a non-invasive tests that could potentially replace amniocentesis and chorionic villus sampling (CVS), and minimize the false positive results generated by them. Hence, with the advent of NIPT, there has been a reduction in the number of women undergoing highly invasive procedures. The purpose of the study is to gain a holistic view of the NIPT market in terms of various factors influencing it such as recent trends and technological advancements of the market. The scope of this report is centered upon conducting a detailed study of the tests associated with the global NIPT market across different regions. The global NIPT market is segmented into five different parts namely by tets, by method, by platform, by application, and by region. The global market value and volume was estimated using these three different approaches and was validated with one another. The global NIPT market is expected to reach $5.67 billion with 7,591,792 units by 2028. With the increasing demand for technological advancements in NIPT across various segments of the NIPT, the NIPT market is expected to witness rapid growth in the future. Further, the increasing insurance coverage and reimburesement policies in the developed markets such as the U.S., Japan, Germany, and the U.K. is the key driver for the growth of the NIPT market. Moreover, the Panorama test dominated the global NIPT market in 2017 among different commercialized tests. However, the IONA test is anticipated to witness the highest CAGR during the forecast period. The trisomy detection application of NIPT witnessed the highest industry demand. Further, the NGS platform for NIPT is also expected to witness impressive CAGR during the forecast period. On the basis of regions, the global NIPT market is segmented into North America, Europe, Asia-Pacific, and Rest-of-the-World (RoW). North America is the leading contributor to the global NIPT market and contributed 51.55% and 52.31% in terms of revenue and volume respectively to the global market in 2017. However, Asia-Pacific is expected to grow at a CAGR of 18.01% and 19.13% in terms of revenue and volume respectively during the forecast period.